Chalet Val d'Isere is a warm and lovely traditional mountain home, located in Ski-Town, USA and Bike-Town, USA - the town of Steamboat Springs. The perfect getaway for all seasons. The inn is located in a small cove of the mountain-secluded and surrounded. Close to the ski area, we can watch the gondola from the breakfast table. The valley views are to the west. In every other direction, we see a treed hillside-beautiful in each season. The bed and breakfast interior is casually elegant, with warm maple wood floors, oriental rugs and interesting collectibles from a lifetime. The fireplace is a wonderful spot to talk, relax and enjoy the peace of the Yampa Valley. The upstairs game room is cozy, with another great view. The pool table, games and television are for your entertainment. In your room, you will find a snack basket with fruit, cookies and chocolate. We are happy to provide coffee, tea and sparkling water all day long. Chalet Val d'Isere is a unique property, built to be a wonderful inn on the mountain. A perfect spot for your honeymoon, anniversary or that great weekend you're planning. Chalet Val d'Isere is my second bed and breakfast. I built La Roca de Tiza, in Nathrop, Colorado and opened in 2003. In 2010 , I sold the home with the intent of moving closer to family. I purchased this new property in 2010. It is totally new-inside and out. It was rebuilt to become a welcoming and beautiful spot for guests. 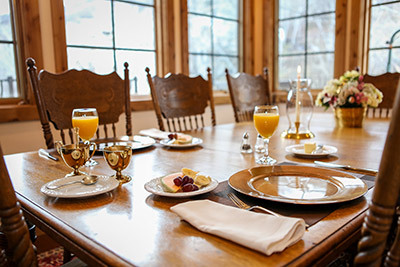 Owning a bed and breakfast is a great opportunity to meet people from around the world, and develop friendships with many. La Roca de Tiza was well known and had received many accolades.